Купить Headrush GIGBOARD с доставкой. Отзывы, обзор, цена, видео, фото. 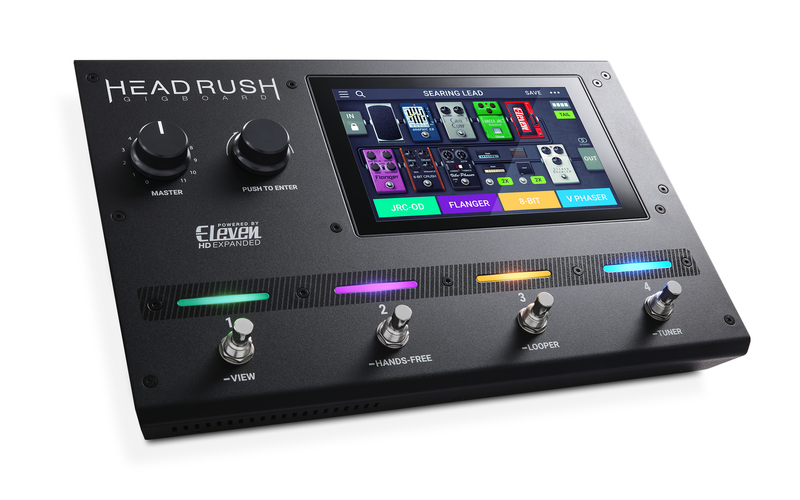 Featuring a finely-tuned quad-core processor and powered by exclusive Eleven® HD Expanded™ DSP software, the HeadRush Gigboard® delivers the most versatile, realistic-sounding and responsive amplifier, cabinet, microphone and FX models ever found in a compact, road-ready floorboard guitar FX processor. The 7-inch touch display enables you to touch, swipe and drag-and-drop to instantly create and edit your rigs in an unprecedentedly realistic and intuitive way. Plus, it features gapless preset changes with reverb and delay tail spillover, a built-in looper with 20 minutes of record time, the ability to load custom impulse response files and exclusive original boutique effects that can’t be found anywhere else. Whether you’re looking for a classic warm vintage amp with natural tube drive, wide ambient stereo delay textures with infinite feedback or the heaviest of heavy djent tone, the HeadRush Gigboard covers it all and everything between. 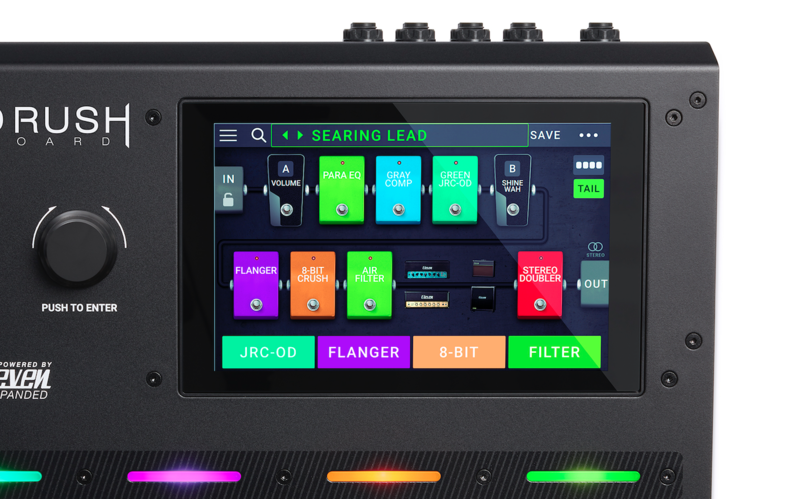 The heart of the HeadRush Gigboard is the 7-inch touch display (Exclusive Patent Pending Technology) and a guitarist-centric, ultra-intuitive user interface – literally touch, swipe and drag-and-drop to instantly create and edit rigs with amazing speed and accuracy. The large display also gives clear feedback when performing live, especially when tweaking tones using the footswitches in 'Hands-Free Mode'. Everything about the HeadRush Gigboard is designed to make it simple, fast and intuitive to jump right in and create amazing sounding rigs in seconds. Housed in a compact and durable road-ready steel chassis, the HeadRush Gigboard includes many thoughtful features for use on stage, including incredibly bright color, assignable LED strips that show each of the 4 footswitches' status for each rig. You can even drag-and-drop to create set lists (custom orders of rigs) for your gigs. The HeadRush Gigboard is a truly convenient and compact way to bring all of the best classic vintage and modern gear you will ever need to stages near or far, without breaking the bank—or your back. The HeadRush Gigboard assimilates seamlessly into your current rig with all the connections you need to handle any performance situation. Combining a ¼-inch guitar input, (2) ¼-inch TRS outputs switchable between amp or line level, a ¼-inch output for headphones, 5-Pin MIDI in/out, plus an onboard ¼-inch mono FX loop to integrate pedals and outboard gear at any point in the signal chain. 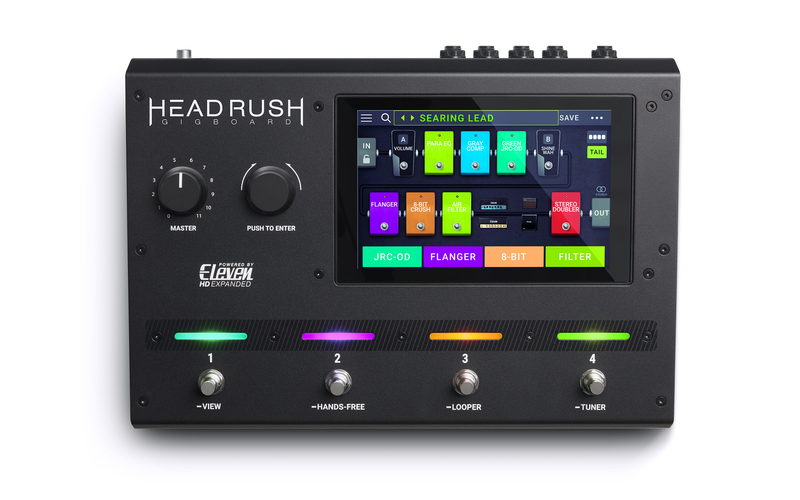 The HeadRush Gigboard also features a pair of ¼-inch inputs to connect an external expression pedal, and a ¼-inch external amp output that can be used to change between clean and dirty channels or toggle other settings your amplifier. The HeadRush Gigboard unites your existing equipment while opening up a world of new sonic possibilities. 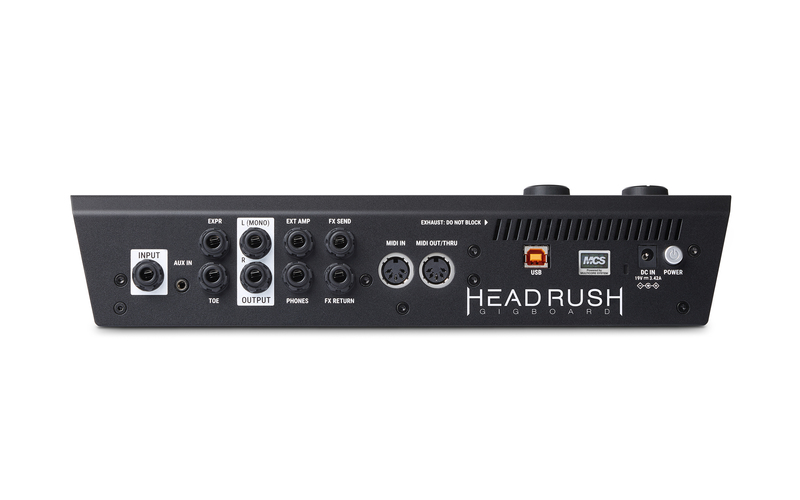 The Headrush Gigboard’s USB port functions as a USB audio interface that records and re-amps at stunning 24-bit 96kHz quality, and it also works to provide a simple drag-and-drop way to load and back up rigs and other files to and from your computer. Guitarists can also load in their own custom band logo for the lock screen, as well as further expand their available guitar cabinet sounds by loading custom/3rd-party impulse response files. HeadRush teamed up with Celestion to include an exclusive download right in the box to get you started, but the HeadRush Gigboard also supports all common wave formats (wav, aiff), sample rates (up to 192kHz) and bit depths (up to 32-bit).